The perception of palliative care is a very misunderstood area of medicine by most people. Typically, people think of palliative care as a place only for those who are terminally ill. However, it is this very misconception that often causes people to refuse to include palliative care in their treatment plan. In fact, palliative care, a more recent addition to the medical world, provides comfort, relieves suffering through pain management and improves quality of life in a wide variety of people of all ages, including those with serious and chronic diseases. Palliative care also seeks to support caregivers as well. Ideally, palliative care should be added early on into one’s treatment plan for it to offer the most benefits. In fact, studies have shown that it is associated with an increased risk of survival. It would be beneficial if palliative care was part of the treatment plan for every illness and here is why. Overall care is offered through a very well-rounded team of medical professionals, from physicians to nurses to social workers. This means that patients who include palliative care as part of their treatment plan are receiving the best medical advise from all medical professionals. Pain often goes undertreated in many people with serious illnesses. However, palliative care professionals focus on relieving this pain and particularly total pain, which goes beyond physical suffering to also include social and psychological suffering. 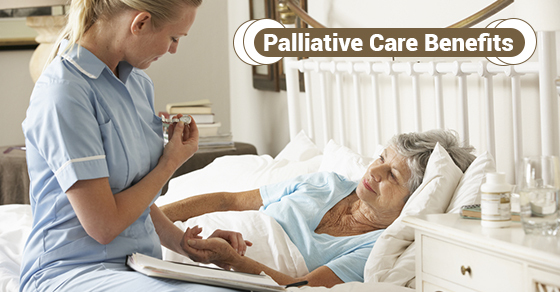 Palliative care also offers treatment for additional unpleasant symptoms outside of pain, including nausea and fatigue. The reason why palliative care is so beneficial is because it treats both the physical and psychological outcome of one’s disease. Naturally, chronic, serious and terminal illnesses can greatly affect one’s well-being and have been linked with poor mental health, such as depression. However, palliative care seeks to manage the emotional effect of one’s illness. Palliative care professionals are also experts at identifying warning signs of emotional stress, meaning that patients can receive treatment earlier than they normally would. Palliative care focuses on improving quality of life via symptom management and offering support to the patient. In some cases, palliative care has even been shown to increase chances of survival. C-Care Health Services offer a variety of affordable, high quality and personalized services. You will feel at peace knowing your loved ones are given the best possible care. Contact us today.